A Tale of Two Cities is a novel by Charles Dickens, set in London and Paris before and during the French Revolution. The novel depicts the plight of the French peasantry demoralized by the French aristocracy in the years leading up to the revolution, the corresponding brutality demonstrated by the revolutionaries toward the former aristocrats in the early years of the revolution, and many unflattering social parallels with life in London during the same period. It follows the lives of several characters through these events. A Tale of Two Cities, by Charles Dickens, deals with the major themes of duality, revolution, and resurrection. It was the best of times, it was the worst of times in London and Paris, as economic and political unrest lead to the American and French Revolutions. The main characters in Dickens' A Tale of Two Cities — Doctor Alexandre Manette, Charles Darnay, and Sydney Carton — are all recalled to life, or resurrected, in different ways as turmoil erupts. 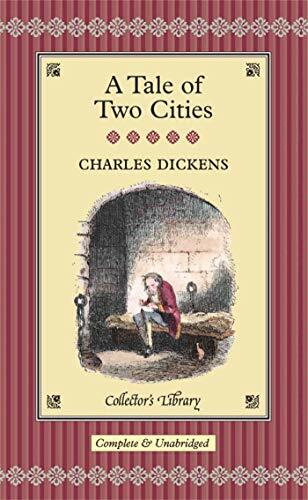 A Tale of Two Cities is one of only two works of historical fiction by Charles Dickens . It has fewer characters and sub-plots than a typical Dickens novel.Dickens relies much on The French Revolution: A History by Thomas Carlyle as a historical source. Dickens wrote in his Preface to Tale that "no one can hope to add anything to the philosophy of Mr. Carlyle's wonderful book". A Tale of Two Cities was published in weekly installments from April 1859 to November 1859 in Dickens's new literary periodical titled All the Year Round. All but three of Dickens's previous novels had appeared only as monthly installments. With sales of about 200 million copies, A Tale of Two Cities is the biggest selling novel in history The 45-chapter novel was published in 31 weekly instalments in Dickens's new literary periodical titled All the Year Round. From April 1859 to November 1859, Dickens also republished the chapters as eight monthly sections in green covers. All but three of Dickens's previous novels had appeared only as monthly instalments. The first weekly instalment of A Tale of Two Cities ran in the first issue of All the Year Round on 30 April 1859. The last ran thirty weeks later, on 26 November. The three most important aspects of A Tale of Two Cities: A Tale of Two Cities is told from the omniscient, or all-knowing, point of view. The narrator, or storyteller, who is never identified, has access to the thoughts and feelings of all the characters. A Tale of Two Cities, which is one of two historical novels written by Charles Dickens, is set in London and in Paris and the French countryside at the time of the French Revolution. The book is sympathetic to the overthrow of the French aristocracy but highly critical of the reign of terror that followed. Dickens characterizes the men and women who populate A Tale of Two Cities less by what the book's narrator or the characters themselves say, and more by what they do. As a result, the novel seems somewhat modern, despite being set in the 18th century and written in the 19th century. Charles Dickens (1812-1870) was an English writer and social critic. He created some of the world's best-known fictional characters and is regarded as the greatest novelist of the Victorian era. His works enjoyed unprecedented popularity during his lifetime, and by the twentieth century critics and scholars had recognised him as a literary genius. His novels and short stories enjoy lasting popularity. Growing up in Portsmouth, Dickens left school to work in a factory when his father was incarcerated in a debtors' prison. Despite his lack of formal education, he edited a weekly journal for 20 years, wrote 15 novels, five novellas, hundreds of short stories and non-fiction articles, lectured and performed extensively, was an indefatigable letter writer, and campaigned vigorously for children's rights, education, and other social reforms. A Tale of Two Cities, Oliver Twist, Great Expectations, David Copperfield, Little Dorrit and Bleak House are among his most famous and popular works.